FactoMineR is included in the Rcmdr environment and therefore beneficiates from all the Rcmdr features. We prefer the Factoshiny Graphical User Interface since it is very easy to use and it can also draw graphs interactively (see here for more information). But the RcmdrPlugin of FactoMineR is more complete and is user-friendly and allows to make graphs and to save results in a file very easily as explained below. The FactoMineR menu is organized according to the different methods implemented. 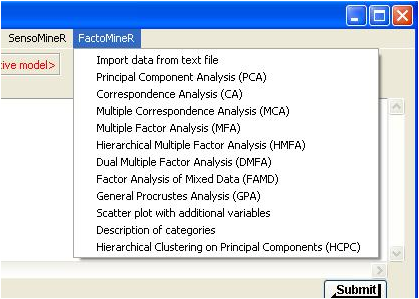 FactoMineR is then included in the R commander environment. You now beneficiate from all the functionalities proposed in the Rcmdr package and consequently have now a very pleasant working environment.
. You then have to restart Rcmdr.